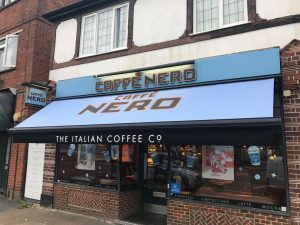 We fitted a new cover on this Caffe Nero site in Banstead. The colours of the cover and signwriting were to the Caffe Nero corporate specification. Whilst we were on site, we checked over the awning and made sure everything was working satisfactorily.